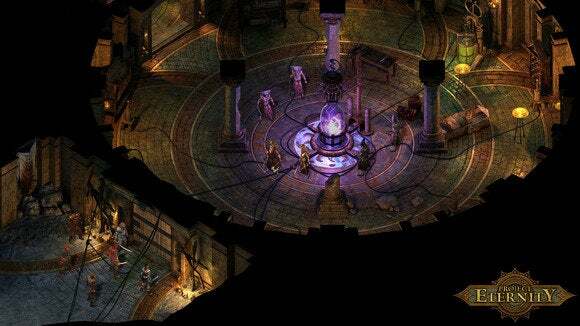 Pretty stunning news courtesy of Polygon today: Obsidian's already planning on a sequel to its upcoming CRPG revival Pillars of Eternity (otherwise known as its love letter to Baldur's Gate), and the game isn't even out yet. Talk about planning big. "We're going to do some expansions because we said we would as a part of the Kickstarter," Obsidian CEO Feargus Urquhart told Polygon, "But with Eternity 2, that's the next thing." The road to a sequel will reputedly start at the end of the month, when Obsidian's Josh Sawyer and Adam Brennecke will sit down and discuss their plans. Urquhart also hinted to Polygon that the studio may or may not approach Kickstarter again to fund the sequel. The original Pillars of Eternity pulled in $4 million on Kickstarter, though the crowd-funding craze has cooled a bit in the ensuing years. Urquhart admits that they'd need "a reason" to go back to Kickstarter, which is why they've already started planning out what they'd like to do for a sequel. We'll most likely have more Pillars of Eternity news next week out of Paradox Con, while the full game is scheduled for a March 26 release date. Hopefully it's good enough to warrant a sequel. For more information on Pillars of Eternity, check out our two interviews with Obsidian's Josh Sawyer here and here.